Debris litters Tyndall Air Force Base following Hurricane Michael in October 2018. Now the Air Force is rebuilding the base to be more resistant to future storms. Unmanned F-16 jets are flying again at Tyndall Air Force base on Florida's Panhandle, and for many it's a welcome sound. 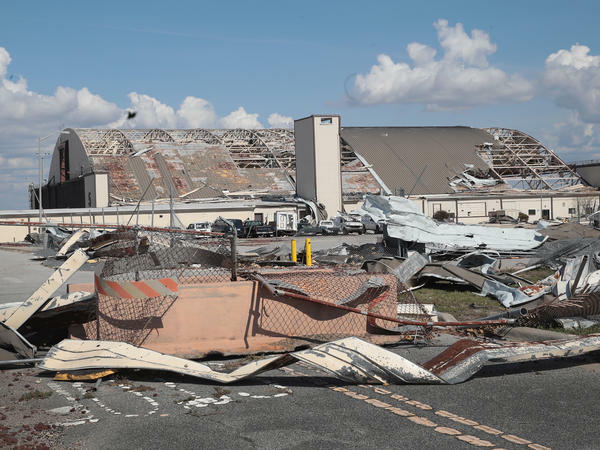 Four months ago the base took a direct hit from Hurricane Michael. The storm's 155-mile-per-hour winds toppled forests, shredded buildings and left the base a mess with its future in doubt. When Air Force Secretary Heather Wilson visited the base just four days after the hurricane, she was awed by the destruction. "It's going to take time to recover," she said. "Anybody who can see this base even from where we're standing can see the substantial damage done by this terrible storm." Thirty-seven percent of the economic activity in Bay County is related to Tyndall Air Force base, so [it is] very, very key to get Tyndall stood back up. - Rep. Neal Dunn, R-Fla.
Today, nearly all the debris is gone. Tyndall has already spent nearly $200 million on cleanup and recovery. Rep. Neal Dunn, R-Fla., who represents the area, says that reassured many who feared the base might not reopen. "That was the first worry everybody had," he said. "Thirty-seven percent of the economic activity in Bay County is related to Tyndall Air Force base, so [it is] very, very key to get Tyndall stood back up." Between people who work there, students who go to school there and retirees who shop there, some 26,000 people rely on the base daily. Because of damage to hangars and other facilities, F-22 Raptor stealth fighters were relocated to other bases. But Dunn says there are big plans for the facility when it's rebuilt. The Air Force wants to base three squadrons of its newest fighter, the F-35, at Tyndall. Dunn says there are also plans to base two dozen MQ-9 Reaper drones there by 2023. "We're looking at almost a hundred combat aircraft based out of Tyndall," says Dunn. "It will actually be busier than it was before the storm." But there's a lot of work to do before then. One focus now is the control tower, which took extensive damage in the storm. "Some debris pierced through a double-paned glass in the tower," explained Col. Scott Matthews, a civil engineer with the Air Force who is part of a group working to rebuild Tyndall. "[The debris] came inside, shot out the other side and caused a bunch of damage in there." Contractors are now working on a total rebuild of the tower interior. Matthews' group is doing more than that. It is developing a new master plan for Tyndall. He says the devastation from Hurricane Michael left the Air Force with an opportunity to redesign the facility into what he calls "the base of the future." Matthews says this will be the first specially designed 21st century Air Force base. "We want to adapt new technologies," he says. "We're talking smart buildings, we're talking layouts and [getting] away from some of the way we used to have our 20th century installations." He says the upside to the destruction caused by Hurricane Michael is that it left the Air Force with a base that is essentially a blank slate. Matthews says that will allow the service to design facilities that aren't tied to specific weapons systems and will be able to adapt to changing needs over time.